I haven't used any measurements as that obviously depends on what you're using it for, how much you need, are you doing one application or numerous. So it's easier to skip the measurement specifics and do it this way instead. Start with the coconut oil in a bowl preferably melted and add the olive oil in, add in your sugar until it is the consistency you like. Add more in for a more abrasive scrub and less for a gentle exfoliator. You can use brown sugar if you prefer as this is softer and less coarse on the skin. Add some lemon juice into the scrub and mix together. Again, this can be altered depending on your preferences and skin sensitivity. 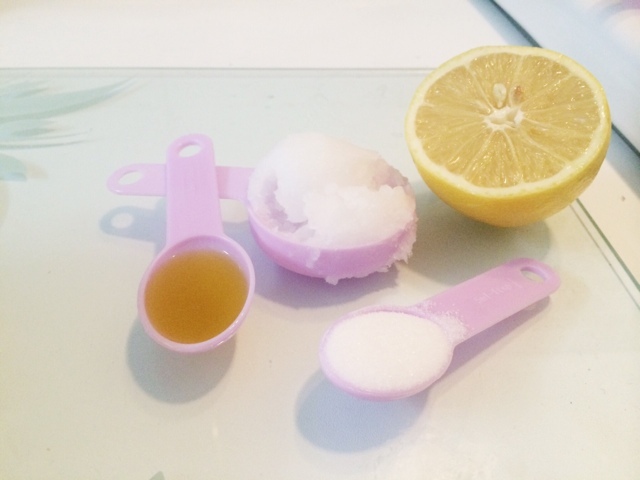 You can also use this as a lip scrub as well and can add in more sugar if needed to make sure all the dead skin is off your lips. I wouldn't recommend using this on your face if you have a lot of sugar in it, as the skin on your face is much more sensitive. You could always use rice or brown sugar. Please remember, after you have applied this, if you are going to be in the sun, you must, MUST wear SPF as lemons and exfoliating increases skin sensitivity and makes it more vulnerable to sun damage. Reapply your SPF if you are out in the sun all day. So, first off, you need something to put it in. Initially I put it in a pot and got a clean spoolie and used that to apply it. But I found it was a bit of a pain, so I found some empty mascara tubes on eBay which is perfect for both brows and lashes. It's not a necessity but you may need a small funnel, just to get some of the products in, depending on if you are using the tube. I found it was okay as the dispensers on all of the ingredients were small enough so it didn't all come pouring out, then I just used the end of the spoolie handle to mix it all up. This is the first ingredient. 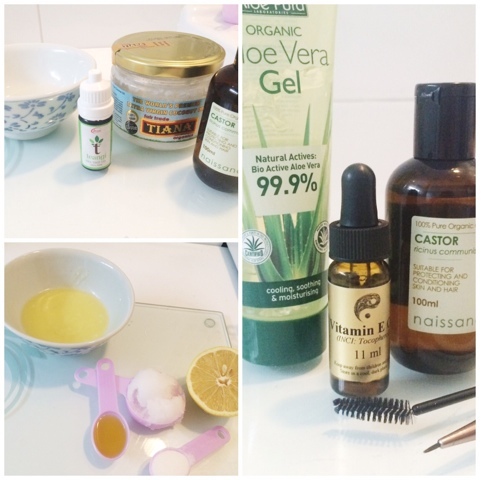 This product has a huge list of benefits, but for this particular DIY, the main ones we need it for is moisturising and conditioning, and Aloe Vera is also known for promoting hair growth which is exactly what we need too. Best known for it's antibacterial and anti inflammatory properties, this is an incredible ingredient. This cures many skin conditions such as; sunburn, acne, dry skin, stretch marks. It helps evade infections. It also is used to delay signs of aging as it penetrates deep into the skin, stimulating collagen and elastin, keeping it soft and hydrated. But the reason we want this is because it also promotes hair growth, is extremely conditioning and is used for preventing the appearance of fine lines and wrinkles, and around the eyes is a popular place for them. This could be used on it's own, but it wouldn't be much of a DIY then would it? You can also put in some Vitamin E oil if you have any but if not then it doesn't matter. Originally I didn't include this because I didn't have any, but I have now purchased some and have put in a few drops. Vitamin E is very nourishing which is perfect for what we are using this for. 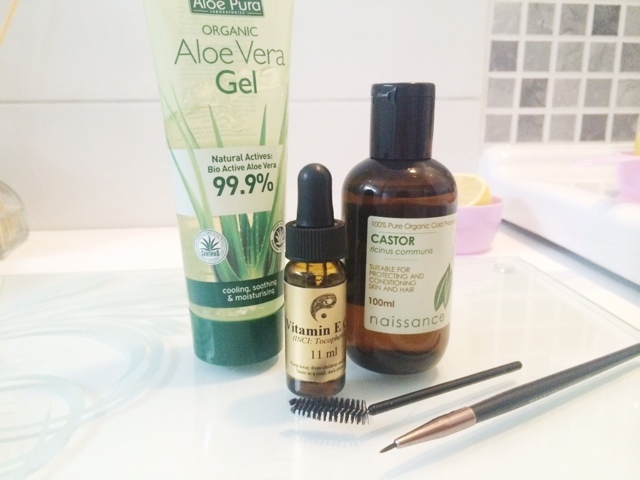 There are DIY lash growth serum recipes that include coconut oil, and I did try that, but this ingredient solidifies when it gets cooler, which makes it very difficult to apply so I threw out that batch and did another one, leaving out the coconut oil. So now you know what we need and why we need it, it's time to start mixing. I say mixing but it's barely that. But you literally use half and half, so half of the castor oil and half of the Aloe vera Gel (although I'm sure you know what half and half means, just incase that wasn't clear enough). If you are using Vitamin E oil, you only need to add a few drops in. Mix it up and wait for the magic to happen. I've been using this for a few weeks and I have seen a difference in how healthy my lashes look and when applying mascara I can notice a tiny bit of difference but I've heard amazing things and I will keep you posted on this. 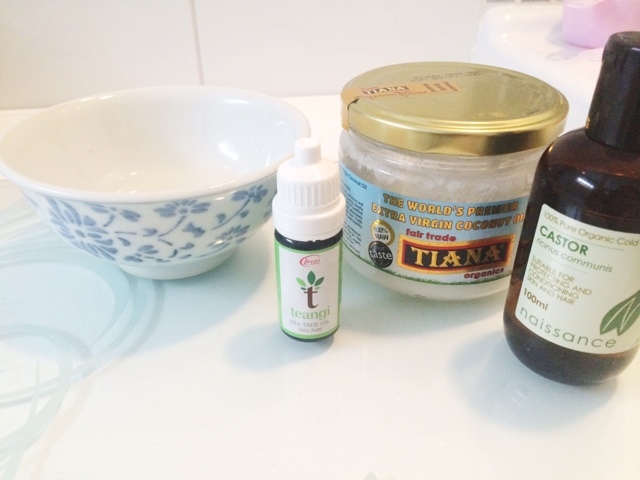 I have two versions of this hair mask DIY, so the first one is to condition the hair and make it super shiny. This just requires Coconut Oil and Castor Oil. This one is mainly to be used on the ends of the hair but can be used on the roots and scalp if need be. The second hair mask is to stimulate hair growth, and this is the same mix as before, but with a few drops of Tea Tree Oil added in too. This may seem like a strange thing to add in, but the Tea Tree Oil is a great hair and scalp moisturiser and is also a great de-dandruff-er as it unblocks the hair follicle and thus eliminates dandruff. Pretty darn clever stuff really. You can also add honey into these masks, this has so many benefits and although it may seem strange to put it in your hair, mixed with the oils it doesn't make sure hair sticky, just as long as you wash it out properly. 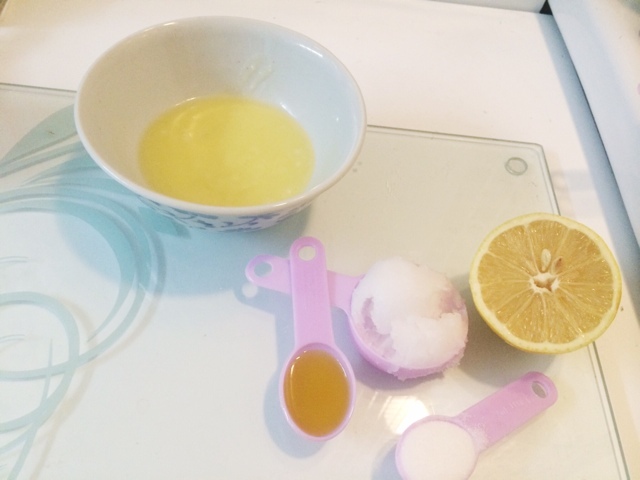 I find when mixing, it is easier to use melted coconut oil first, but this mask can be difficult to apply for some people, so put in the fridge until the coconut oil hardens slightly, and this should make it easier to scoop up and apply to the hair. Just don't let it harden completely otherwise it's going to be impossible. I normally make a small amount of the one to include the tea tree oil in, and then a slightly bigger amount for the one without - I don't normally make a huge batch, I just make enough for one application. I put the growth stimulating mask all over my (dry) scalp and really massage it in well, and then with the moisturising one, I slather the rest of my (dry) hair in the stuff so it is all covered. Depending on the time I have, I either tie it up in a bun and sleep with it in overnight (you can wrap your hair in cling film or just a shower cap, to really lock in that nourishing goodness, and make sure it doesn't get on your pillow), or I just leave it in for a few hours and then wash out. Make sure to really wash it out well. I normally shampoo it twice to make sure it's all out - Castor oil is quite thick so it can take a while to get it all out. I leave my hair to air dry if I'm not going to work or anything (no point doing a great treatment like that to then use heat on it) once your hair is dry. It will be so soft and shiny and just feel so much healthier. I love this hair mask and I highly recommend giving it a go. Let me know if you end up trying any of these DIY's. I would love to see if they work for you. And, if you want any other posts which go into more detail about particular ingredients benefits for your skin and hair then please let me know. I hope you enjoyed this week. Let me know if you try any of the things I've mentioned this week. Will you be trying any of these? 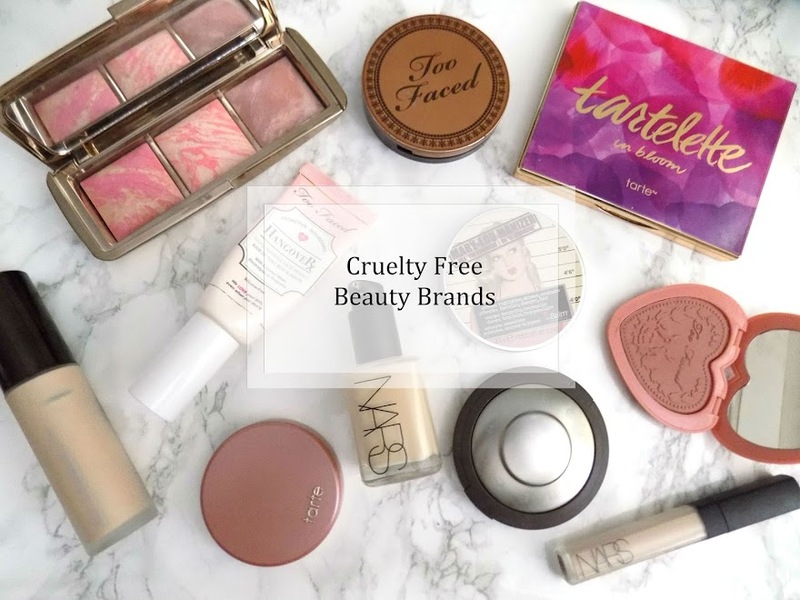 ** Disclaimer: I do not actively use only natural and organic products. This is just something I have become very interested in recently and I am finding my footing with what works and what the benefits are for these amazing ingredients.